On the surface, giving Spidey his own set of wheels is not a terrible idea. Batman has the Batmobile. Wonder Woman has the invisible jet. The Avengers have the Quinjet. Why not give Spider-Man his own mode of transportation? some state-of-the-art technology. According to the comics, Corona Motors was looking for a way to promote their new non-polluting automobile engine. Who better than to promote this environmentally friendly breakthrough than your friendly neighborhood Spider-Man? 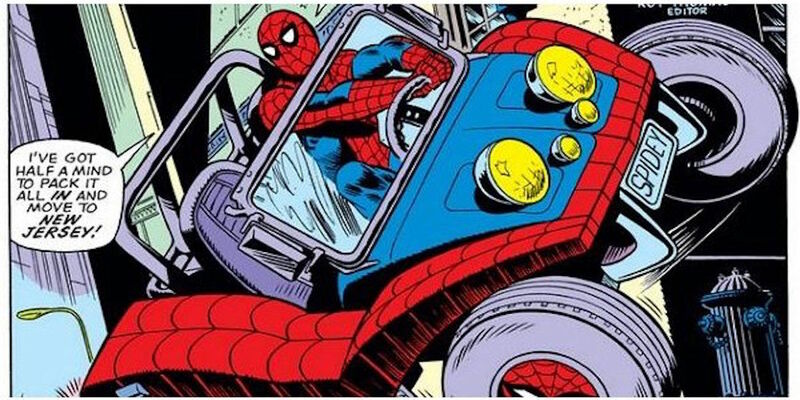 With the help of Johnny Storm (aka The Human Torch), the first Spider-Buggy, or Spider-Mobile if you prefer, was born. After a few successful runs with his new toy, Spider-Man crashed the buggy into the water while under the influence of the powerful Mysterio (Amazing Spider-Man #159-160). And this is where things start to get really weird. After first being unable to locate his lost car, Spidey does eventually find it … although now it’s been modified and turned evil. The inevitable battle of hero versus auto takes places with Spider-Man coming out the victor. He “retires” the buggy only to find it later on display in the Smithsonian. But the saga of Spidey’s wheels doesn’t end there. In recent years, Peter Parker’s own company (Parker Industries) brings back the Spider-Mobile. This time the car is upgraded with some 21st century improvements, including the ability to scale surfaces and web-based airbags. All this thing needs now is an electric motor from Tesla and Spider-Man really will be cruising in the hippest ride in town.